Are you planning or implementing data platform consolidation? After the actual migration, it is very important to track down the changes in the overall system performance in order to understand how it went and are there challenges. This is also the topic that Pinal Dave, the author of SQLAuthority blog, is covering in his recent article. "Let’s assume you had 100 servers with a total of 150 instances in your old data platform and then you carefully planned a new data platform. The new platform has only 30 target servers, each containing 5 instances on average. Even though it is easier to maintain a significantly smaller set of servers, it should be able to ensure that sufficient service levels and performance are met in the new platform—or even exceeded—by understanding the correlation between the configurations and correlation between the performance counters between the old and new system." Pinal writes. So what does this mean in practice? And how to do the comparison? "Actually, there is a software available that can do all the above, in addition to the consolidation planning and right-sizing of the system, making your job easier, faster and more accurate. It is called SQL Governor. 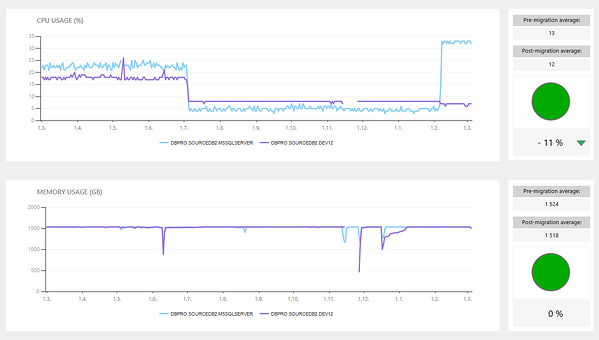 With SQL Governor, you can run the diagnostics jobs, monitor your data platform, create consolidation plans from old to new data platform, and compare the monitoring data between the old and new data environment." Read the full article from SQLAuthority and learn how to ensure a successful data platform consolidation. Image: annual comparison on performance counters between the old and the new data platform in SQL Governor software.